Curl up with a "have to read" book in your favorite chair and relax. A room just isn't complete without a few stylish chairs to lounge in. 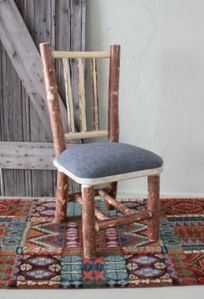 Rustic furniture such as stand alone chairs can give a room character and help complete your "look and decor." LodgeCraft offers chairs that are both stylish and comfortable from a variety of manufacturers in the USA and abroad. Visit our Montana showroom to view and sit in those we craft or others like the Old Hickory traditional line or Colorado Cabin. You can choose all wood, cane back and seats, upholstered back or seat, or a nice oversized lounge chair. We have scoured the country looking for the best quality and various styles and designs. View our site or come into one of our two showrooms to see chairs on the floor and an array of catalogs and fabric samples for ordering just what you want.